The United States Attorney General is the head of the United States Department of Justice concerned with legal affairs and is the chief law enforcement officer of the United States government.The Attorney General is considered to be the chief lawyer of the U.S. government. The Attorney General serves as a member of the President's Cabinet, but is the only cabinet department head who is not given the title Secretary. 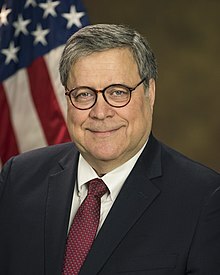 The current Attorney General is William P. Barr since February 14, 2019. He replaced Jeff Sessions. ↑ 1.0 1.1 1.2 Served as acting attorney general in his capacity as deputy attorney general, until his own appointment and confirmation as attorney general. ↑ On October 20, 1973, Solicitor General Robert Bork became acting attorney general following the "Saturday Night Massacre", in which U.S. Attorney General Elliot Richardson and Deputy Attorney General William Ruckelshaus both resigned. ↑ Served as acting attorney general in his capacity as deputy attorney general, until the appointment of a new attorney general. Thornburgh later served as attorney general from 1988–1991. ↑ Served as acting attorney general in his capacity as Assistant Attorney General for the DOJ Civil Division. Gerson was fourth in the line of succession at the Justice Department, but other senior DOJ officials had already resigned. Janet Reno, President Clinton's nominee for attorney general, was confirmed on March 12, and he resigned the same day. ↑ Served as acting attorney general in his capacity as deputy attorney general, until the appointment of a new attorney general. Holder later served as attorney general from 2009–2015. ↑ 6.0 6.1 On August 27, 2007, President Bush named Solicitor General Paul Clement as the future acting attorney general, to take office upon the resignation of Alberto Gonzales, effective September 17, 2007. On September 17, President Bush announced that Assistant Attorney General for the DOJ Civil Division Peter Keisler would become acting attorney general, pending a permanent appointment of a presidential nominee. According to administration officials, Clement became acting attorney general at 12:01 am September 17, 2007, and left office 24 hours later. Keisler served as acting attorney general until the confirmation of Michael Mukasey on November 9, 2007. ↑ Served as acting attorney general in her capacity as deputy attorney general, until she was fired after stating that the Department of Justice would not defend an executive order in court. ↑ The legality of Matthew Whitaker's appointment as Acting Attorney General was called into question by several constitutional scholars. Among those included Neal Katyal and George T. Conway III, who asserted it is unconstitutional, because the Attorney General is a principal officer under the Appointments Clause, and thus requires senate consent, even in an acting capacity. Maryland filed an injunction against Whitaker's appointment on this basis. John E. Bies at Lawfare regarded it as an unresolved question. The DOJ Office of Legal Counsel released a legal opinion, asserting that the appointment was legal and consistent with past precedent. ↑ "3 U.S. Code § 19 - Vacancy in offices of both President and Vice President; officers eligible to act". Retrieved November 7, 2018. ↑ Labaton, Stephen (January 25, 1993). "Notes on Justice; Who's in Charge? Bush Holdover Says He Is, but Two Clinton Men Differ". The New York Times. Retrieved December 12, 2008. ↑ 6.0 6.1 Ifill, Gwen (March 12, 1993). "Reno Confirmed in Top Justice Job". New York Times. Retrieved December 12, 2008. She will replace Acting Attorney General Stuart M. Gerson, a holdover appointee from the Bush Administration. Ms. Reno said he resigned today. ↑ Meyers, Steven Lee (August 27, 2007). "Embattled Attorney General Resigns". The New York Times. Retrieved August 27, 2007. ↑ "Bush Text on Attorney General Nomination". NewsOK.com. The Oklahoman. The Associated Press. September 17, 2007. Retrieved September 18, 2007. ↑ Eggen, Dan; Elizabeth Williamson (September 19, 2007). "Democrats May Tie Confirmation to Gonzales Papers". Washington Post. pp. A10. Retrieved September 19, 2007. ↑ Perez, Evan; Diamond, Jeremy (January 30, 2017). "Trump fires acting AG after she declines to defend travel ban". CNN. Retrieved March 12, 2018. ↑ "Opinion | Trump's Appointment of the Acting Attorney General Is Unconstitutional". Retrieved 2018-11-15. ↑ "Maryland Says Matthew Whitaker Appointment As Acting Attorney General Is Unlawful". NPR.org. Retrieved 2018-11-15. ↑ "Matthew Whitaker's Appointment as Acting Attorney General: Three Lingering Questions". Lawfare. 2018-11-08. Retrieved 2018-11-15. ↑ CNN, Laura Jarrett,. "DOJ says Whitaker's appointment as acting attorney general is constitutional". CNN. Retrieved 2018-11-15. This page was last changed on 6 March 2019, at 11:49.